Quintessentially British design and exquisite craftsmanship combine with the vintage-inspired Emmy London collection. This 1/2 carat marquise cut diamond solitaire in platunum has a glistening diamond halo, diamond shoulders, and a secret diamond in the band. Featuring I1 certified diamonds and an independent IGI certificate. 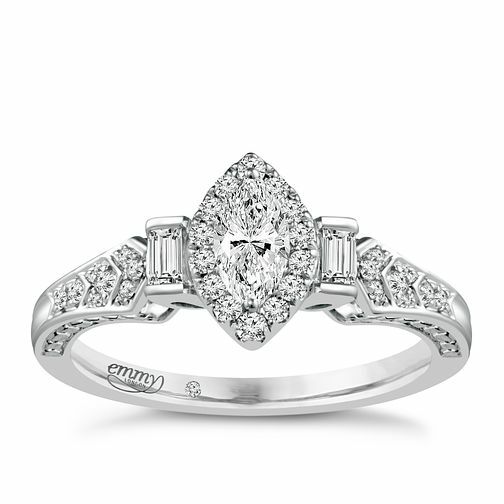 Emmy London Platinum 1/2 Carat Diamond Solitaire Ring is rated 5.0 out of 5 by 1. Rated 5 out of 5 by Anonymous from Stunning This is my engagement ring. I get so many compliments on it. It's different. I love the shape of the main diamond. It's beautiful and has an Art Deco feel to it. So pretty. Also the platinum metal means the white colour will not change.